If going to the dentist makes you nervous, consider this: Some patients are so anxious they gag at the mere sight of an instrument, while others have to worry because they’ve accidentally swallowed a dental drill bit or a tiny screwdriver. Both of those scenarios are serious subjects in the latest issue of The Journal of the American Dental Association, where experts say research shows the urge to gag is often founded in fear — and a gut doctor warns his dental colleagues not to wait for dropped crowns or other objects to make their way through a patient’s digestive system. Such things would include the dental implant screwdriver that Gunaratnam removed a few years ago from the colon of a 47-year-old patient. 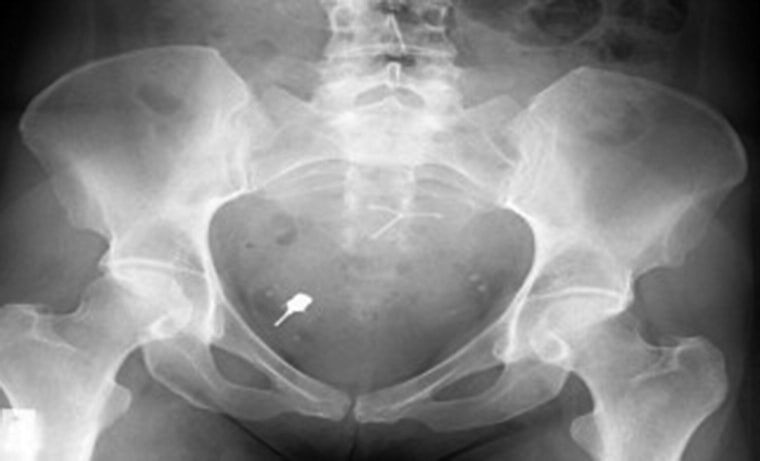 It had been there for two months, ever since the woman’s dentist dropped it accidentally down her throat. She was told the object would eject on its own, but it never did, posing a serious threat to her health. He details four other case reports in which patient ingested endodontic files and crowns. It happens more often than you’d imagine, said Gunaratnam, who figures he sees 10 or much such cases every year. Instead of sending patients home to wait, dentists should make sure to refer patients who’ve swallowed objects to a doctor or emergency room for fast removal, he said. That makes sense to Edmond Hewlett, professor and associate dean at the University of California, Los Angeles, School of Dentristry. Swallowing objects is rare, but it does occur and current guidance calls for a chest X-ray — and a wait-and-see approach. “It’s fair to say we’re going to have to reconsider our existing protocol,” said Hewlett, who is also an ADA consumer advisor spokesman. Charles Hodgson, 68, a Michigan tax attorney, accidentally swallowed a drill bit dropped by his dentist five years ago. But he was sent immediately to the ER, where X-rays revealed the object and it took an overnight hospital stay and three tries to retrieve it through his throat. Helping patients who gag requires equal finesse, according to Daniel McNeil, a professor of psychology and dentistry at West Virginia University in Morgantown. He and a team led by Cameron Randall, a doctoral candidate at WVU, wanted to find out if gagging during office visits was associated with fear or anxiety about going to the dentist. “For those who have a very severe problem with gagging, their problems can begin even in the waiting room,” McNeil said. That, in turn, can lead to patients avoiding dental care entirely and risking serious health consequences. They asked nearly 500 patients who visited a campus dental clinic waiting room to answer questions and fill out forms. To their surprise, nearly half of the patients reported gagging during at least one dental visit in the past and 7.5 percent of them reported gagging always or almost always. When they compared the gagging behavior to dental fear, they found that those least likely to gag reported less fear and fewer negative beliefs about dentists, while those most likely to gag were most fearful. Of those in the high category, more than half would gag if fingers or dental instruments entered their mouths. That provides valuable information for helping patients, McNeil said. Dentists who know that gagging is not just a physical response to stimulation, but an indicator of fear, can work to calm anxious patients. Techniques include asking patients to breathe slowly, to count numbers, to wiggle their toes or lift their legs. Some patients are helped with gradual desensitization techniques, like practicing using troublesome bitewing X-ray holders, which often trigger gagging. “If a patient can feel successful getting X-rays accomplished, that can be a helpful step for them getting future dental care,” McNeil said.